The ability to work with multiple catalogs is one of Lightroom's many great features, no doubt! There are numerous scenarios where you would need to transfer photos, their metadata and develop settings from one catalog to another: data backup, performance considerations, workflow, travel, teamwork, etc. While the transfer can be done quite easily using the Export as Catalog and Import from Catalog functions, there is no easy way to sync up the contents of published collections. Not without a little help from the Lightroom Voyager anyway! 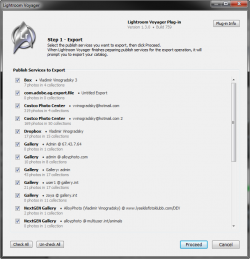 Lightroom Voyager is a Lightroom plug-in that enables you to transfer published collections and contained photos from one catalog to another. Provides the ability to transfer published collections between catalogs on the same computer or even on different computers. New in version 1.3.0: Supports smart published collections. New in version 1.3.0: Transfers publish service settings to the target catalog. Fixed the issue with linking photos to published collections when migrated photos already exist in the target catalog. Windows: Fixed the issue with using the plugin when the Documents folder has been moved from its default location. Fixed the "can't convert userdata to JSON" error causes by some 3rd party plugins. Fixed the issue with migrating photos contained in smart publish collections. Fixed the Mac OS installer. Improved compatibility with Lightroom 6. Added the ability to migrate publish service settings and published collections, without any photos (for situations when all photos are already in the target catalog). Now the automatic restart of Lightroom is less confusing. Improved the display of publish service names when their respective plugins are not installed or disabled. Added the ability to select individual albums for the migration. Fixed issues related to large (over 1 GB) catalogs on Windows. Fixed the issue with migrating published services to very large catalogs, over 1 GB in size. Fixed the "attempt to index field '?' (a nil value)" error. Fixed the "Unable to Proceed. Unable to access the Quick Collection in your catalog." error in some rare cases. NEW: The plugin now can migrate smart published collections and contained photos. NEW: Now the plugin can automatically configure publish services in the target catalog. Windows OS: Fixed the error when the username contains accented characters. Remove the LrVoyager.lrdevplugin folder, then install the update using the new installation packages. Added the ability to select publish services during the import phase. Fixed several issues specific to Mac OS. Fixed error "attempt to index global 'toolModule' (a nil value)". Fixed a couple of internal issues with calculating the expiration period of the trial version. 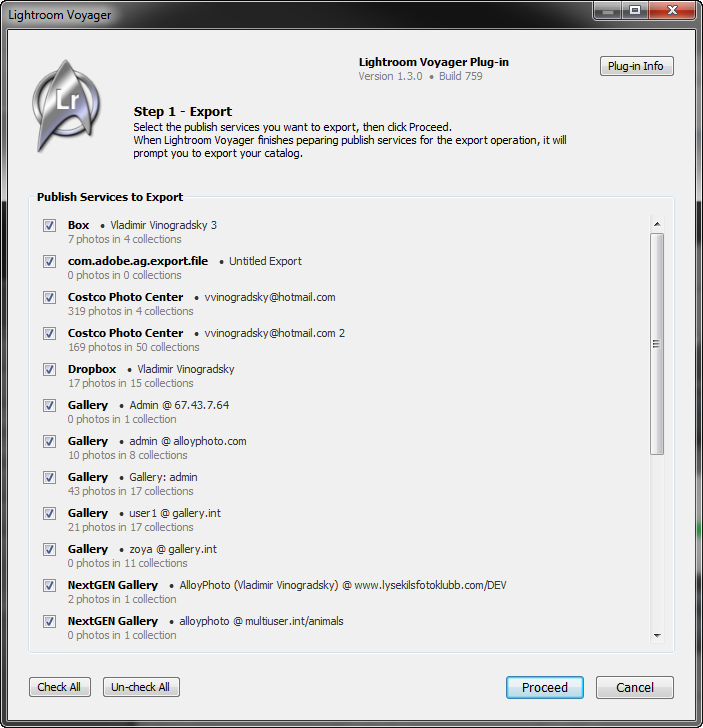 The plug-in is now compatible with Lightroom 3.6. The Publish Service list is now sorted alphabetically. Fixed the issue with not displaying publish collections for default plugins that are part of Lightroom. Fixed the issue with not recognizing collections that are actually eligible for migration. Fixed the issue with some of publish services not being selected by default. Fixed the issue with recognizing and matching publish services with certain names. Improved the layout of the Export and Import dialogs and added the ability to resize the dialogs. Now the plug-in can automatically update itself. This is the first release of the product. Using version 1.5.2 witch LightRoom CC 2015.8. Exactly what I was looking for. Simple and good working. Thanks!